The best sports facility owners do more than just market their services with mailers, online strategy and signs and flyers inside their facilities. They and their staffs also physically go out into their communities — and beyond — to show future clients what professional services that they can expect to receive at their sports facilities. Brad Hall exemplifies this marketing quality perfectly at Geaux Play, his indoor sports facility near Birmingham, Alabama. I recently talked to him about hosting external sports camps, which he started doing for fun and for service to his community during his indoor sports facility’s slow summer season. The camps soon became a valuable marketing tool that led to new clients for Geaux Play. After my chat with Brad, I decided to write down some lessons I took away from our conversation. If you’re interested in learning how to take a more hands-on approach in marketing your sports facility face-to-face in your community, here are some steps to consider. Try to target communities that don’t have access to a sports facility like yours. I often see sports facility managers focus their marketing efforts toward neighborhoods within a short commute to their facility, only to find that customers will often drive in from much farther areas to get a quality product. In Brad’s case, Geaux Play is located in a suburb of Birmingham, Alabama, and has access to numerous small, rural towns within a few hours’ drive. These communities don’t have big sports facilities and often haven’t heard of the advanced baseball training techniques that Brad uses in his facility in Pelham, Alabama. Such smaller communities may also be potential markets for your sports facility. Learn which sports leagues and sports organizations in those communities could benefit from your services. Do some research; if your sports facility offers training in a number of sports, the leagues and organizations that you can reach out to abound. You can research these organizations online, or collect info through social media or word of mouth. Establish relationships within those leagues and communities, and determine what skills their memberships need the most. This takes time and effort, but is definitely worth it once you reach a mutually beneficial arrangement. Brad, for example, had established some such relationships through previous work as a camp and clinic instructor. Host camps or clinics at a low cost for those leagues and organizations. Send your best staffers to host fun, affordable skills clinics to members. Brad says that the kids who found out about Geaux Play from the camps he hosted in rural areas often carpool to his facility to make the longer trip more manageable. But even if your campers don’t become clients, Brad points out that it’s fun to introduce kids to advanced techniques who may not have had the opportunity otherwise. Make sure to put your best foot forward, and make it easy for potential clients to follow up with you. Obviously, all your effort will go to waste if the camp or clinic you host is sub-par, or even on par with something the attendants already have easy access to. Showcase your most unique offering, whether it’s an expert trainer, a new technology, or an cutting-edge training method. 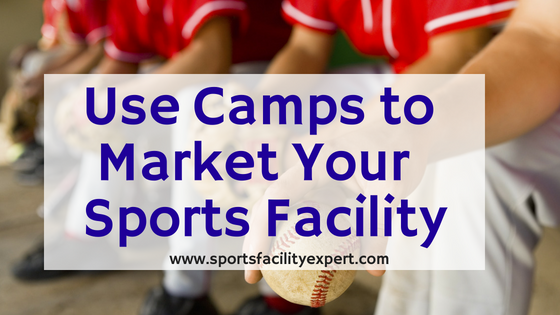 And make sure that the kids have an easy way to follow up with you by handing out business cards or skills flyers describing your in-facility camps. A version of this post was originally published in June of 2011.